To recognize and bestow honor to those who made sacrifices in accomplishing its goals. The formation of RIAA was initiated with donation from Rev. T. Eugene Oody, a former Ricks Institute Principal and Missionary, who, along with his church in California, contributed six thousand dollars. Its beginning was complete with enthusiasm as the following were accomplished: the constitution and bylaws, membership data bank, convention plans, formation of at least two additional chapters, communication via newsletter and its later incorporation in 1993 as RIAA, USA, Inc.. In order to affect its goals earlier plans were made to have an Annual Convention that would rotate throughout the United States where Alumni reside. This was meant to reach out and involve as many alumni as possible. The first convention was held in Boston, MA from August 31 to September 2, 1990 under the chairmanship of Mr. Dave L. Dixon. Its success was historical, as it brought together not only alumni but also, former faculty members and associates who had not recruited for over twenty years. 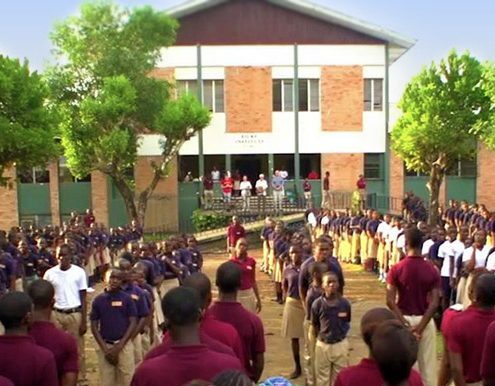 Ricks Institute, a grade school from K to 12 Grade, is a learning and faith community of the Liberia Baptist Missionary and Educational Convention, Inc. Ricks Institute seeks to achieve a distinction throughout Liberia and beyond in offering a balanced and integrated education of the head, heart and the hands by providing its students with a firm foundation for life and the inspiration to serve others. Our clinic is available to all students 24 hours and the community. Volunteers from Lewis Chapel Baptist Church visited and served with our dedicated staff in providing quality health care to Ricks students and surrounding communities. Students and staff convene daily in Washington Chapel for daily devotions to begin the school day. The Worship Services are held every Sunday. Visit Ricks Institute website for more info.